The above info came from Sophie, and was edited by yours truly (contact me). The image came from deviantart. Sawada Tsunayoshi is a student from Namimori Jr. High whose luck never seems to improve. Because of this, the kids in his school have meanly nicknamed him "No Good Tsuna". But one day, as he returns to his home, he finds an infant, Reborn, who claims to be his new home tutor. Reborn informs Tsuna that he will train him, for he is the one to become the next mob boss in the Vongola Family; the biggest, strongest and best known mafia family in the mafia world. 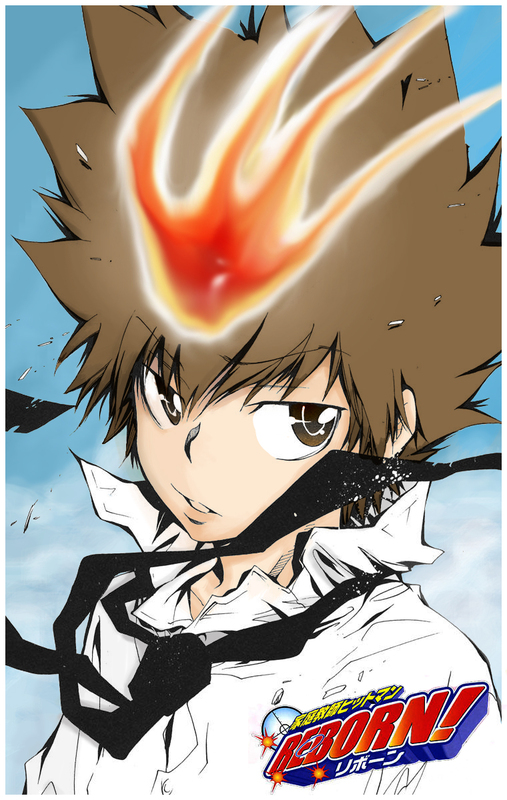 Reborn shoots Tsuna with a special bullet that brings his dying will (or regrets at the verge of death) out. This allows Tsuna to develop extraordinary strength and abilities. Even with all this amazing things, Tsuna rejects the fact that he must become a mafia boss. Reborn doesn't pay attention to Tsuna's negativity though, and continues to train him. But along the way of his training he begins to make more friends, and discovers a side of himself that was unknown to him. The above description came from Sophie, and was edited by yours truly (contact me).